If you're looking for the perfect accessory or new ATV to load up in your new toy hauler from Starr's Trailer Sales, consider the new Polaris Sportsman WV850 H.O. It offers the latest in twheel technology, a literal mashup of "tire" and "wheel" which results in an airless tire, with tons of additional features. 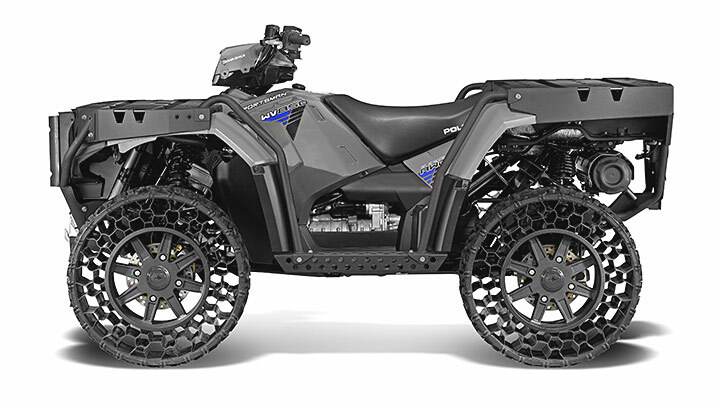 The new Sportsman line from Polaris is the first publicly-available airless tire called "TerrainArmor" . This new type of technology enables riders to enjoy flat-free riding as the wheels can literally never go flat. These wheels were initially developed by the military to withstand ballistic damage and puncture wounds from railroad spikes. So there's a good chance TerrainArmor wheels can stand up to anything in your backyard. Besides innovative run-flat abilities; the TerrainArmor wheels also offer riders a better center of gravity, improved handling, and a unique tread pattern designed specifically for the WV850. Many may brush off the new Sportsman as a gimmicky toy with little value. However, the ATV has many features beyond the unique wheels. You'll find steel racks on the front and back that have a 200-pound and 400-pound capacity, respectively. The standard 2-inch receiver has a towing capacity of 1500 pounds with an optional upgrade to a 3000 pound Warn winch to tackle any task. The engine gives riders 77 horsepower of torque and pulling power to accomplish any job. Underneath everything, you'll find a military-grade transmission to give you dependability and ease-of-use.